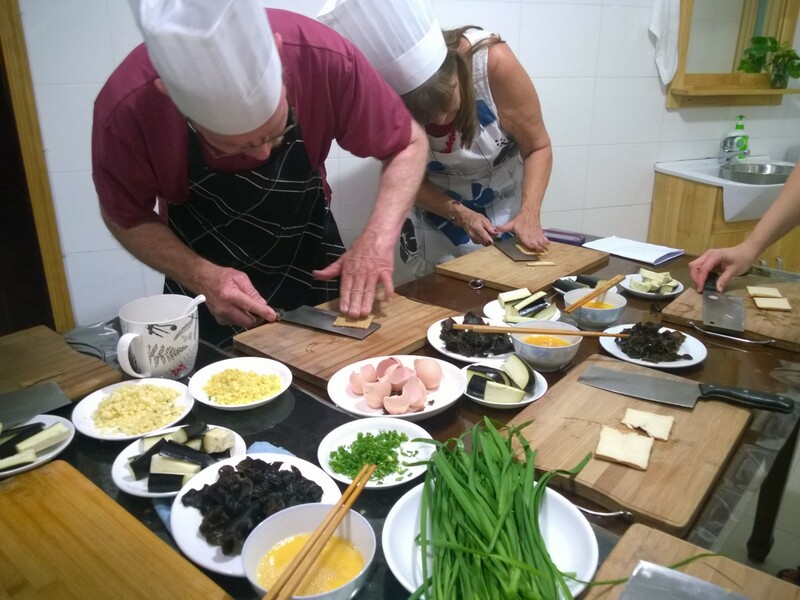 We enjoyed our cooking class this summer with James so much that we just had to do it all over again with our visitors, Patti and Larry. What fun! With Dodo as our guide, we walked from the subway meeting point off the 10 line and walked to the local wet market for all our ingredients. 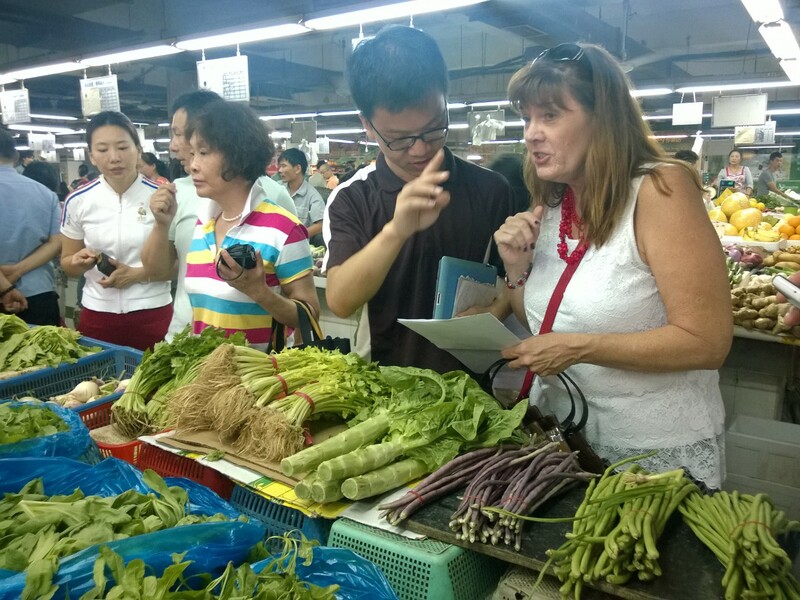 For $50 US per person, our class of six headed to the market and then off to Helen’s apartment to learn how to cook Chinese style. Marti and Emily, from the U.S. teaching at the International School in Shanghai, were our other class mates. These classes always attract such interesting people and we love hearing about their adventures. They had met in Thailand teaching and had taught in four countries. I can only imagine what fun they have learning from their diverse students and travelling the world. I’m not sure if that would fit our lifestyle but it is intriguing. 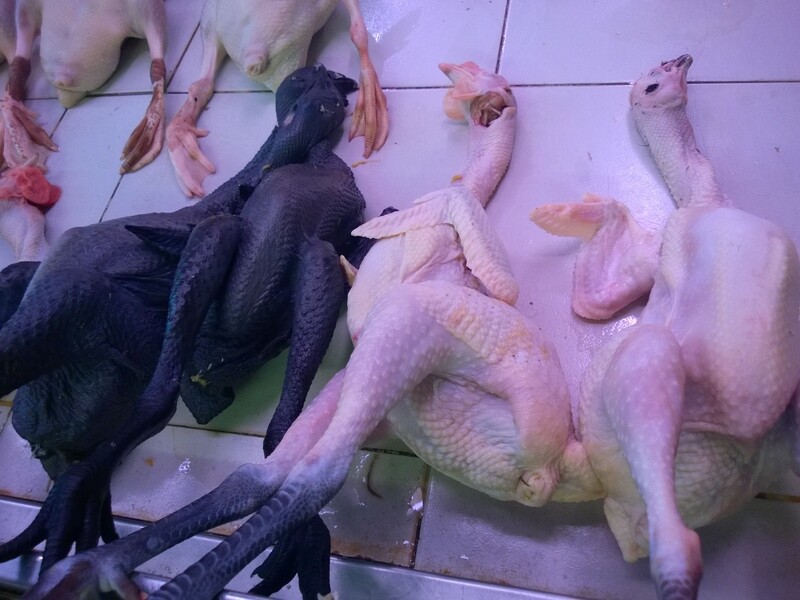 Black chicken vs. white chicken?? Back to the food, though. We had warned Patti and Larry to wear masks because the smells are POTENT PLUS at the market. The lower floor is all meat and seafood with claws and hooves taking center stage as well as live fish and turtles and frogs plus the option of black vs. white chicken. So many choices, especially for Emily, the vegetarian in our group. NOT! There were bones and meat everywhere with no refrigeration in sight. It’s just not done here in China. On the upper floor, you can buy your fruit, veggies, eggs (no refrigeration again), noodles and spices. We enjoyed learning that the darker eggs are less healthy than the lighter eggs because they are farm raised. The black eggs take one month to go through the salting process that make them black. Patti handled the money and bought our Chinese chives, garlic, sausage and eggplant. 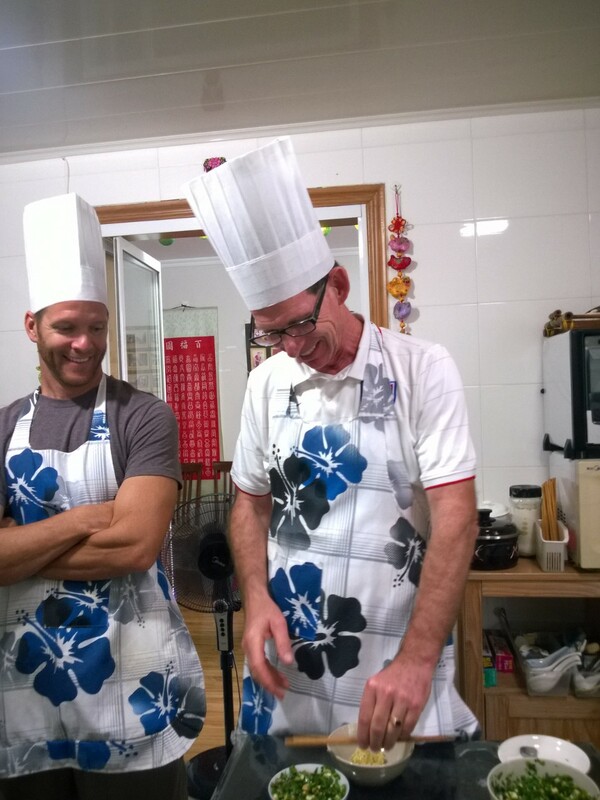 Our menu consisted of eggs with black fungus, spring rolls, paozi buns and eggplant with sauce. Right off the bat, I almost sliced off a finger with the huge cleaver so Helen, the cooking instructor, quickly took it away from me and let me watch until I insisted I would be more careful. We chopped and mixed and fried our way to delicious (or so they tell me-I didn’t eat a thing due to my weak stomach) while we washed it all down with a rice wine that had some kick and tea.